Strokes on the panels are aligned to the outside, so all space inside the stroke is the actual size of the panel. And please correct me if I'm wrong. I've more than quadruple checked everything but you never know. 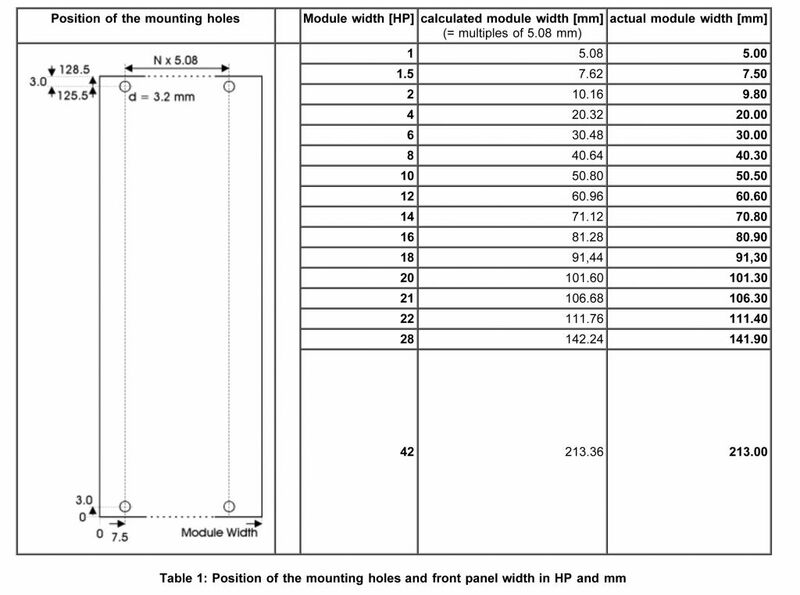 The center of the leftmost mounting holes start 7.5mm from the left edge, holes are 3mm from the top/bottom, holes are 3.2mm in diameter, and the rightmost holes are all multiples of 5.08mm from the leftmost holes. Edit: Probably should mention that these are Eurorack templates! Saved a copy in CS4 format for you! Assuming that functionality in Illustrator is working properly. They open just fine in Inkscape, btw. EDIT: Checked and works fine thanks! Apologies for bringing this back, but a big thanks! I want to build a BOB for the Cirklon that has some bonus features (attenuverters, inverted cv, buffered multed outs, etc). I'll know better what features when I can play around with layout a bit - and this will be perfect for that! If anyone is looking for parts to go with their mockups, I have some here. Not updated in a while because I haven't had need or time, but may be helpful to someone. I has jacks, pots, switches, and LED's. I wrote an extension for Inkscape to draw eurorack panels. Does anyone have templates for 4u or serge? Thanks this is awesome - will make my artistic creations sooo much easier! Pretty old thread, so not sure anyone will see this, but I've just whipped up a parametric blank eurorack panel for Fusion 360. Disclaimer: I haven't built/cut any of it yet - and I don't even have a legit rack to put them in But thought I'd throw this out here to see if there's any interest in me sharing further progress. Nice, hadn't heard of fusion 360, but that is interesting. With respect to your drawing, I think the right side mounting holes are also on 7.5 from the right end, right now they look a bit close to the edge. I use slotted holes centers on HP-3x5.08, 7,5mm from left side. The slotted holes give you the opportunity to close some gaps (there will be tolerances). My understanding of the Doepfer specs linked above is that the right-side holes should be at a multiple-of-hp distance from the left-side holes. My understanding of the Doepfer "specs" linked above is that they are wrong. They are merely a bad copy of the original DIN/IEC specs with rounding errors and without any tolerances or clearances. You can get a copy of the original from Schroff. Panels are on page 14. On first glance it looks like there is a mistake with the "n x 5.08"s, but n is not the HP number or the same number in both instances, it really means integer multiple of 0.2"
The original DIN standard was based on a 0.1" grid and then converted to metric disguising its underlying structure. So 1HP is really 0.2" which is 5.08mm. The distance of the fixing hole centre from the left is 0.3" which is 7.62mm NOT 7.5mm. 17" of rack width would have been 85HP, but they made it 84HP because it factorises better and you can have 1/3 width (28HP), 1/4 width (21HP) and 1/6 width (14HP) panels that line up. Consequently the mounting angles of 19" frames are 0.1" wider than other systems that use the full 17". 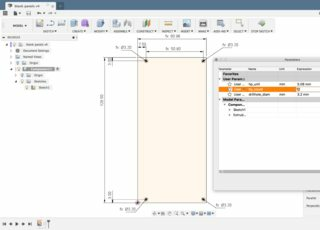 1) Create a panel in Front Panel Express to the correct spec. 2) Export as an SVG with reference points. 3) Place the SVG in Illustrator in a new document of the same size as the panel. 5) Create guides on all the hole centre references. 7) Create a new layer for the panel graphics and others for knobs, etc. 8) Design your panel using the guides to centre knob scales and text around the holes. 10) On the PDF file only, delete all non-graphic layers. 11) Select everything left and convert text to outlines. 12) Save this file again. 13) Import the PDF file into Front Panel Express and send it off to be made. The Doepfer specs are not "wrong" because they are his specs, not the DIN/IEC specs. He doesn't claim they are the DIN specs. They don't match the original DIN/IEC specs but they still work. The Tolerances are built into the dimensions given in that drawing and not depending on the designer to put them in. Basically the panels shown narrower than a full HP. The "actual module width" vs the "calculated module width" which would be the HP width if using a metal shop that has a +0/-X tolerance. The hole in not the exact 7.62mm from the edge for this reason. The more important dimension of hole to hole is in HP, and with a narrower panel than the full HP, that nudge keeps the hole pairs more our less centered in the panel space. I have made hundreds of panels following those dimensions and have never had one complaint about them not working. 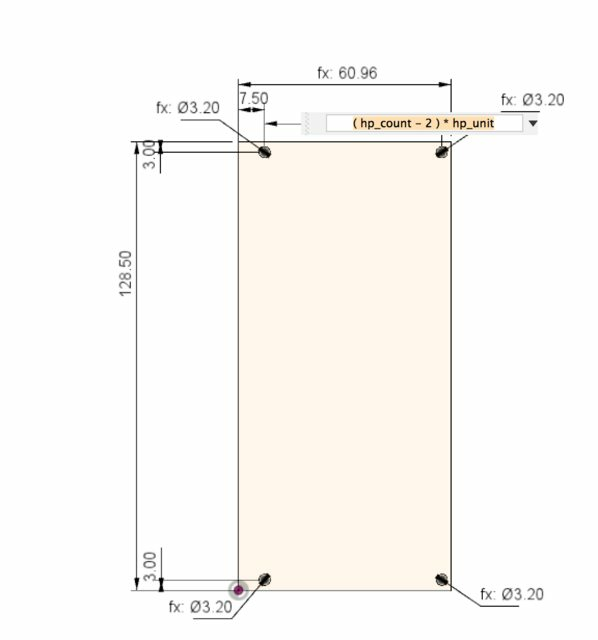 There are some companies that make panels specs to the exact HP width, and not having done metalwork before, don't even know how to set or read tolerance specs on metal drawings, and we get panels that are too wide. The dimensions on that Doepfer drawing would work with inexpensive houses with larger + tolerances. To be clear, are we talking about outside dimensions, or the position of the rightmost mounting holes? Regarding outside dimensions, yeah, you are playing it more safe when using the doepfer dimensions. Regarding the rightmost mounting holes, doepfer has "N*5.08" but N is not the same as the HP number. If the two were the same the width of the material left after making the right hole to the edge of the panel is about 1mm which is a woefully tiny edge. Again, put them both at around 7.5 from the edge (on a 12hp wide panel, the hole pitch left-right is 9*5.08) and use slotted holes. Hadn't noticed that fusio 360 is constraint based, but that is very nice (I work with Creo/ ProEngineer at work). Regarding the rightmost mounting holes, doepfer has "N*5.08" but N is not the same as the HP number. That is correct. The "N" is just saying it is a multiple of 5.08mm, the number is totally up to the maker of the panels. Typically it is as large a "N" as you can make that fits with the hole around 0.3" from the other edge. Some makers of 8HP panels for example, only use the 2 left side holes (Doepfer is an example) while others use four total holes. It is all up to the maker. Panel makers could also have holes 0.1" from the edge too, at the first available standard HP hole location, if they felt like it, and the panels would still work next to panels using the Doepfer spec. This is the standard for everyone except Analogue Systems, who chose to have their holes around 5.08mm from the edge. Even AS is now making modules with obround holes that can be used for both placements. These are actually using the correct holes for this job, unlike all the other obround holes I have seen which are centered around the Doepfer positions. The important bit is that you are not using obround holes, the distance between the hole should be a multiple of 5.08mm or it won't work in a threaded strip. The distance from the righthand set of holes cosmetically will be around 0.3" from that side depending on how your tolerances are set up for the overall panel width. Well.. isn't that obvious? If it were, the right-side hole would be... outside the panel? -- the formula i'm applying is distance_from_left_hole_to_right_hole = X*5.08, where, as an approximation, X is HP_width - 2, which kinda works, but I'll want to refine that when I actually get to design different widths of panels. * I'll be cutting those on a laser cutter at a local maker space - not too hard to redo and adjust as i go. * In the first instance, this is purely for me, and I don't even intend to use a proper rail. If and when I do, I'm aware I may have to re-cut some of those panels - which I fully intend to do because I don't expect my first-ever panel designs to be usable or satisfying. That said, thanks for the discussions and insights - most definitely useful! The Doepfer specs are not "wrong" because they are his specs, not the DIN/IEC specs. He doesn't claim they are the DIN specs. They don't match the original DIN/IEC specs but they still work. Doepfer used/uses standard DIN/IEC frames, they weren't built to some other spec. The whole point of using a standard is to stick to it. If someone bastardises it and then someone else bastardises that and so on you end up with incompatibility. One of the reasons for Eurorack's dominance was that it did not use a proprietary format tied to one manufacturer and hardware was readily available from many sources all conforming to the DIN/IEC standard. The Tolerances are built into the dimensions given in that drawing and not depending on the designer to put them in. Basically the panels shown narrower than a full HP. That is a clearance, not a tolerance, and is already built in to the original spec. Tolerance cannot be built in, they are a range of values that defines what is acceptable and what is not after the manufacturing process. I have made hundreds of panels following those dimensions and have never had one complaint about them not working. And then mount them on non-standard Vector rails with sliding nuts. Are you suggesting that they won't work on vector rails with sliding nuts, or that I have to use Vector rails to make them work? Since Doepfer has literally made thousands of modules using those panel specs, they seem to work just fine on thousands of rails, both with threaded strips and sliding nuts, of all sizes and dimensions. They are not that far from the DIN specs to be a problem it seems. I have Schroff rails, Vector rails, and whatever rails Doepfer used to use, and currently uses (I have both 84HP and 85HP cabinets from him) in my studio and easily have mixed plenty of Doepfer with many other makers with no problems. I use threaded strips (both M3 and M2.5) in all but one small mini skiff and the only problems I have ever encountered were with the five AS modules I have. I could put them in one row and that would fix that if I cared about not drilling new holes in them (which I did). What I'm trying to point out is that by using those dimensions from the Doepfer mechanical page, you will not make panels that won't work. They may be "wrong" compared to the DIN specs, but they will work just fine in Eurorack systems alongside everybody but AS. Doepfer makes 1.5HP blank panels to compensate for AS if you don't want to drill holes in them (or don't have a row to dedicate to them).